Looking to spend a night in the woods inside an old train car? Check out the Coupling Reserve in northern Ohio. Developed around a historic railroad theme, The Coupling Reserve is 20+ acres in Erie County between Milan and Huron on SR 13. The park is open to the public year round from 7 am to dark, although vehicle access is restricted in certain areas during the winter months. Erie MetroParks also holds organized programs at The Coupling Reserve throughout the year. The Coupling Reserve can go camping without all the mess of camping and, get to spend the night inside an authentic railroad caboose, complete with kitchenette, restrooms and showers. 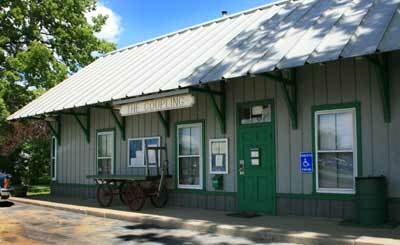 There is a boxcar, caboose, and station house. The railroad station house was built in 1882 and prior to being moved to the Coupling Reserve, lived in Monroeville, just southwest of the Reserve. The boxcar was used as a bunkhouse for railroad crews, and can accommodate 18 overnight guests. The 1920s caboose has 8 bunks. Reservations for the Depot, Station House, overnight lodging or group canoe use are accepted one year in advance of the planned use date through the Southwoods Office at (419) 625- 7783 or reservations@eriemetroparks.org. 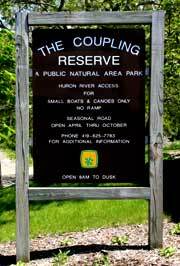 The Coupling Reserve offers public access to the Huron River for small boats and canoes. It also hosts a variety of organized programs by Erie MetroParks, such as canoeing and hikes, throughout the year. Visitors are also encouraged to frequent the park to enjoy the beautiful scenery and wildlife on the nature trails. Erie MetroParks mission is to preserve, conserve, protect, and enhance the natural and unique historical resources of the park district and to provide opportunities for visitors and residents to use, enjoy, understand and appreciate these resources in a responsible, sustainable manner. The Coupling Reserve offers rustic, low-cost alternative lodging to youth and family groups in Ohio's historic Firelands. Those looking for a unique overnight experience, which is less weather dependent than tent camping, and which may include a visit from an infrequent mouse or other wildlife, will find this MetroPark a pleasant change of pace.